The term “Corporate Social Responsibility” has gained lot of momentum in the last few decades. Carroll's pyramidal model has made significant contribution to the debate by categorizing corporate social responsibility into four broad dimensions: Economic, Legal, Ethical and Philanthropic. This paper looks into different dimensions of corporate social responsibility and tries to deconstruct its primary motive. Through the scanning of literatures on the definitions of corporate social responsibility concept, this paper tries to understand the focus of such an attempt. It then takes the help of qualitative in-depth interview methodology to understand what the corporate managers in India across sectors feel about corporate social responsibility. This leads to convergence of literature review and in-depth interview findings benefiting both academic and corporate world. The findings suggest that although companies seem to accomplish such responsibility for societal purposes, the ultimate objective is an economically viable model which leads to the sustainability of a corporate organization. 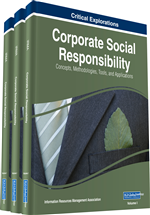 Corporate Social Responsibility (CSR) as a term has gained currency in the last few decades. However, the concept dates back to the industrial revolution when the employees forced the management to show concern about the working conditions in factories. Corporate houses, in the initial stages of its evolution, came into existence as a separate institution which looked into the needs of the society in an objective manner. Today, with the advent of a concept called “globalization” interconnectedness has crept in every institution existent in society. The result is a change in perspective of corporate institutions. India post 1991, with Liberalization, Privatization & Globalization (LPG), witnessed the influx foreign multinational companies into the Indian soil. Although ontologically, globalization is not a new concept, the epistemological assumptions view globalization through its agents like multinational and transnational corporations and how they affect the indigenous companies of different countries. Scholars like Grewal and others were of the opinion that multinational companies would have their headquarters in their home country, and have one or more of its subsidiaries in a geographically dispersed location (Grewal et al., 2003). However, according to Petkovic and others, transnational companies would have their headquarters in home country but their offices in other countries would not act as subsidiaries or branches. Instead, they would be standalone companies with no barriers in terms of standards “one can produce and sell anywhere in the planet” (Petkovic, T & Rakic, M, 2010). While transnational companies have originated only in the 1980s, majority of the companies are multinational since the term gained currency in 1960 through IBM. The terminology “globalization” dates back to the Bretton Woods Conference in 1944 with the formation of the International Monetary Fund (IMF) and the World Bank (WB). The axiology of globalization has shown that while McLuhan’s “global village” is a reality, yet there are questions of the centre and the periphery, the inclusion and the exclusion, for whom societal development is done and the reason for it. Before delving directly into the different ways in which corporate social responsibility has been defined, it would be interesting to know a bit about the way in which it originated. The praxiology of corporate social responsibility dates back to 1800 during the industrial revolution when the employees of organizations wanted the corporate to take care of the working conditions and forced the owners to do something for the industrial working conditions. Till civil war, corporate social responsibility was limited to philanthropic work. After the civil war, there was monopoly of the business with the corporate houses gaining power. Corporate social responsibility was put to the back seat. This led to labour unrest which ultimately led to great depression. Post-depression, corporations realized the impact of corporate social responsibility on their business and their identity as servers of society. They were looked upon as institutions like government and hence expected to work for society. Patrick Murphy divided social responsibility into philanthropic era (prior to 1950), awareness era (1953-67), issue era (1968-73) and responsiveness era (1973-78).